In a keynote speech in June last year the PM spoke about his commitment to improving social mobility. In the same month, Jon Thompson - Permanent Secretary at the Ministry of Defence - was announced as the Civil Service’s new social mobility champion. Both spoke passionately about their commitment to helping people from a wide range of backgrounds to achieve their full potential. As someone who came into the Civil Service from a working-class background, these messages really chimed with me. I knew what the Civil Service had been doing to improve other aspects of diversity, including gender and BAME, but I couldn’t identify the equivalent work programme for social mobility. What I didn’t know prior to the June announcement was that the Civil Service had noticed this gap themselves, and were primed to make the announcement about Jon. I was so pleased to hear this, and quickly approached Jon to offer my support. Whilst it’s very early days for this new strand of diversity work, it’s clear that the Civil Service is fully committed to it, and it’s starting to gain some real momentum. Those working with Jon have been eagerly awaiting the publication of the Bridge Group report into the Socio-Economic Diversity in the Fast Stream. The main findings were announced in a speech by Matthew Hancock, Minister for the Cabinet Office. Whilst the report is focused on the Fast Stream only, it has some interesting stats. It states that only 4.4% of successful applicants to the Civil Service Fast Stream are from working-class backgrounds, in comparison to the third of the population in employment who are working class. The line that struck me the most was this one – “the profile of the intake is less diverse than the student population at the University of Oxford.” This really surprised me – Oxford is known for not being particularly diverse (although is also working to tackle this) – and even though I feel like I’m in somewhat of a minority in the Civil Service, I didn’t expect to hear that the Fast Stream is less diverse than Oxford. On a personal level, I found this quite ironic. I had an interview for Cambridge Uni but talked myself out of it the week of the interview (who would conclude I was clever enough to go there?). You can imagine this went down well with my parents, particularly my Dad, who had rather prematurely had already told his friends down the pub that his second-born was going to Cambridge. Anyway, I might have talked myself out of that one, but there’s some irony in the fact that some years later I applied for something that is evidently in a similar league of trickiness, and I made it. I was really proud of myself, and one of the things I remember from my first day - apart from being mildly terrified throughout - was ringing my Mum after work and telling her my DD was the "poshest person I’ve ever met." I’ve just about acclimatised now. So why does all this matter? Well, diversity matters. People achieving their full potential matters. Feeling like you fit in and can add value - even though you might not be the same as everyone else - matters. It matters for business, and it matters for individuals. If we are going to be the best Civil Service we can possibly be, we must reflect the population that we serve. The Bridge Group report makes some recommendations on how to make the Fast Stream more diverse. I hope these help. But I also hope that we manage to find a way of obtaining data on the whole organisation so that we can understand the wider picture and how the Civil Service compares with other organisations. I hope that we support those within the organisation from all kinds of backgrounds, to feel like they fit in and that their contributions are valued. For me, my background manifests itself in a lack of confidence - I don’t have the same accent or vocabulary as others and I haven’t had the same educational or cultural experiences. I often find myself unable to keep up with conversations about life experiences – I can’t relate to the cultural reference points. But what I do have is drive and determination to be the best civil servant I can be. I hope that the work Jon is leading both helps increase the diversity of the Civil Service, and also supports those already within it to believe in themselves and achieve their full potential. Follow Fast Stream on Twitter: @faststreamuk. Assuming you're in the main Graduate Fast Stream scheme, you would be one of 9 working-class entrants in the 2012 cohort - quite simply a shocking state of affairs that the whitewashed Bridge Report doesn't really put across very strongly. I wouldn't bet on it changing fast. The Bridge Group report essentially - and laughably - concluded that the only reasons few working class kids get in is because they don't apply and they're not as talented as middle-class kids anyway. And there are no plans to alter biased selection procedures that lead to middle-class applicants to the Graduate Fast Stream being almost four times as likely to succeed as working class applicants and black applicants to the Fast Stream only having about a quarter of the chances of success as White applicants. It Is positive that Ministers are exercised about this though and hopefully they'll eventually see through middle-class, privately educated officials (who see nothing really wrong with recruitment processes that are effective at recruiting privately educated middle class graduates like them) pulling the wool over their eyes. @ Dwayne: I totally agree that it’s a shocking (and depressing) state of affairs. In defence of the Bridge Group report, working class kids not applying to the Fast Stream is a significant part of the problem. Along with the profile of the intake being less diverse than the student population at Oxford, as Charlotte highlights, the report also identifies that the profile of applicants is much closer to the profile of students from Oxbridge than that of the wider student population. That’s a serious problem, because obviously the CS can’t recruit people from lower socio-economic backgrounds if they don’t apply. I think the report’s recommendations for action to try and change the profile of Fast Stream applicants are important. And I don’t think the report concludes that working class kids are less talented. It identifies that a higher proportion of candidates from higher socio-economic backgrounds progress at every stage of the selection process – but its recommendations rightly focus on what changes should be made to the selection process, not on this being a problem with the candidates. Having said that, I have to admit that I have sympathy with employers trying to grapple with this issue, just as I do to a slightly lesser extent with universities in the same position. They should absolutely take action to challenge and change their own processes and selection criteria, to eliminate bias etc, and I think there is still much to do in these areas. But sadly I suspect that the most important changes need to happen much further up-stream. By the time people come to apply for the Graduate Fast Stream they’ve spent 17-18 years in education. To put it bluntly, if those 17-18 years have turned one bright, talented person into an articulate, confident candidate who is able to clearly demonstrate all the skills needed, and another bright, talented person into an inarticulate, unconfident candidate who might or might not develop the skills needed, then is it unreasonable for an employer to select the first candidate? Can I have a translator, what on earth is Social Mobility is this yet another meaningless Buzz word!! Translated, Social mobility can be described as the relationship between our starting point in life and where we end up as adults - usually in relation to income, occupation and status. I am none the wiser, meaningless rubbish as per usual. Apropros "social mobility" - if you achieve something in life that your parents didn't or weren't able to do, it is, arguably, as simple as that. It could just as equally apply to somebody from a very rich or a very poor family going to university, when their parents had not. Either way, none of us should feel constrained in life by the circumstances in which we were born. The United Kingdom, despite certain imperfections, is clearly a meritocracy. Thank you for this really helpful, honest and enlightening blog. Great to see how a civil service wide initiative can impact at a personal level. Your story really brings some of this to life and I suspect will be much more powerful than charts and graphs. This is an interesting read, however isn't the idea of working and middle classes becoming quite blurred? What now constitutes middle class...a private education, what about those educated in selective yet free schools - are they middle class just because aged 11 their parents supported them in getting through some sort of assessment? What about these 'middle class' young people who are now stuck in rent traps in London (who cannot aspire to anything but 95% indebted home ownership - in 10 years when they've saved a deposit)? How many of these fast streamers come from non-russell group universities, have had permanent, relatively medium term roles prior to applying for graduate schemes? Why do 'non-working class' folk not apply to the civil service? Maybe it's something to do with the majority of roles being in London, which unless you are prepared to make big sacrifices on lifestyle, commuting and standard of accomodation is unaffordable to graduates, therefore only those with bank of mum and dad behind them feel able to relocate, does this apply also to the private sector? You have hit the nail on the head re London. Fast streamers are more likely to be from the Home Counties and therefore far more likely to apply than someone from Manchester. The Government has not addressed the need for departments to be moved totally out of expensive London, except for those that are absolutely required for Parliament. I also think that life experience is valuable and this too should be taken into account - all young recruits to the Fast Stream is not a healthy situation, especially where their life experience has been somewhat pampered. Or worse Charlotte, has someone inferred that you're working class because you hail from the seaside resort of Cleethorpes 🙂 - That would be infinitely worse than any other assumption this report is going to make! Every single Cabinet Secretary we have had, has been an Oxford graduate (apart from Maurice Hankey who, although privately educated, joined the Marines and thus bypassed the Oxbridge circuit, and he also sort of invented the post). The Civil Service, like everything else in Britain, is not a reflection of its population but a reflection of its ruling class. Of the 9 working class entrants to the 2012 cohort, I wonder where they went? I wonder how many were banished to the regions of England? I wonder how many actually took up leading posts in the Foreign and Commonwealth Office, Parliament or Downing Street? What the magical 9 figure - dismal though it is - does not tell you, is where working class entrants ultimately progress to. Excellent article. It's helpful to hear what the Civil Service is doing and reading your story brings it to life. I really like your point about both increasing the diversity of the Civil Service as well as supporting those already within it to have self-belief and to achieve their full potential. My only comment is that some of the discussions on class distinctions here in the comments and in the Bridge report make the issue too simplistic. I agree with Interested's comments about the lines on class being increasingly blurred in modern society and the need to avoid a binary approach. I went to a not particularly good comprehensive school in a northern town but my parents went to university (when free grants were available) and so they would be classed as middle-class. I was lucky enough to be awarded a place at Cambridge University (because I gave the interview a go, unlike Charlotte), having never expected to get in. This was based on merit, not class, background or accent. However, my hard work and efforts at gaining a place and at getting my degree mean that I'm now seen as one of the elite. I'm placed in the same category as those who went to grammar schools, private schools and boarding schools, with all the opportunities, privilege and confidence associated. 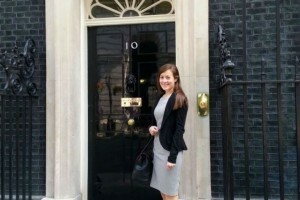 I agree with Charlotte's inspiring words and her hopes for the civil service. I just ask that we take a more nuanced approach rather than simply looking at working class versus middle class Fast Streamers, or Oxbridge versus non-Oxbridge civil servants. These issues are really important and deserve deeper exploration. I just wanted to say I completely agree with you, and RM below. I am in much the same situation as yourself (parents who attended University when financial support was abundant, went to a comp, and attended Oxford). I like to think that my degree is the result of merit, mainly because I can't see how else I got in. However it's really disheartening to hear myself put in the same group as people who have been privately educated their whole lives, and who have the financial backing to live comfortably in London rather than having to sacrifice their standard of living to be visible on Whitehall. According to the criteria I have heard for social mobility I'm one of the elite, but it really doesn't feel like it. Nuance is incredibly important on diversity issues, but particularly so for social mobility. I worked hard for my degree but, when I hear people in my office discussing conspiracy theories about the 'secret support' that Oxbridge candidates receive (that I definitely didn't get the invite to), I do start to question why I bothered. Hi Catherine, A and RM: I agree that this issue is very complex and at an individual level it can feel unfair and frustrating when people use these broad-brush categories and definitions. Most of us probably feel that we worked hard to get where we are, and of course class/ socio-economic background is only one of many, many factors which influence how easily we ‘progress’ in society. In my own case, I had a comfortable but not wealthy start in life and went to a bog-standard primary school. Then I won a scholarship to an all-girls private secondary school, and subsequently went on to Cambridge and into the Fast Stream. That puts me firmly in the ‘privileged’ category in most people’s minds, and I certainly appreciate that I was immensely lucky to get the education I did. However, the other side of the story is that I worked enormously hard throughout school and university, was a painfully shy child and have struggled seriously with confidence issues throughout my life, and felt like an outsider in each of those institutions. Despite appearing to be a stereotypical Fast Streamer in terms of background, I didn’t seem to have many at all of the expected characteristics of Fast Streamers, and it took me years to start to believe that I was the equal of those around me and that I had something valuable to contribute. Having said all that, I can see that at a societal rather than individual level, categorisation by something like socio-economic background can be useful and can enable changes to be made to help shift the overall patterns of social mobility. It’s important though to create a multi-factoral definition for such concepts rather than relying too heavily on certain aspects of a person’s background, such as their educational history, which is not necessarily indicative of their socio-economic background – and should hopefully become less so, as educational establishments work to improve the diversity of their own intakes. What worries me is that you are all on the Fast Stream yet do not understand socio-economics. You may of well worked hard, however, you still had/have chances that 92% of the country did not. There is no evidence that the people produced from these schemes produce anything other than a sense of entitlement. Rather than being thankful that you had these opportunities you impose that working class individual are lazy, as you 'worked hard', therefor implying that your ability to work hard was why you got where you are; and by default those who don't do well is down to the fact they don't work hard (How Dickensian of you, good job we have forward thinking individuals in the CV!). One of the major reasons for attainment at A-level and University is based on socio-economic grounds; if you are rich you worry less, so can spend more time studying , playing hockey, lacrosse, and ruggers. But well done you! You achieved what 40% of the rest of the country did while actually having to worry about things, and without private tuition. Oh and well done for getting on to an elitist graduate scheme…………. I hope you are proud. I went to a top university, but I know my privilege. Stop turning this into some sort of middle class crying group, you are just making us look worse. Catherine - I'm glad to hear someone in a similar position to me. I too went Oxbridge (Oxford in my case) from a not particularly good comprehensive school in a northern town although parents both left school at 16. It irks me that my hard work and the encouragement and support of my parents causes some people to put me in same category as the likes of our PM and the Mayor of London. The Civil Service - and Russell Group universitites - do need to look at their application and intake pool but there does need to be more nuance. Thank you, Charlotte - this is a great article, and it's fantastic to read personal stories rather than just facts and figures. I'm pleased that the CS is addressing this issue, but I also agree with some of the other commenters that there needs to be more nuance, and people shouldn't be put into 'class' boxes, as we are all individuals with our own stories to tell. I am quite sure I would fall into the 'middle class' box - I was educated at a private school in a northern town, but 1/3 of the children at my school were there on the old govt. assisted places scheme. Ironically there was more social diversity at my school than at the local state grammar, which recruited only from a middle class area! Also, I take exception to the stereotype that anyone from a 'middle class' background has had a charmed and easy existence. We all have our challenges to deal with - in my case that was a serious chronic illness, so I wasn't actually at school all that much, as I was too busy being ill in hospital. Being middle class provides no immunity from such things. I am proud to work for the CS (I didn't get here through the fast stream route, but am at a similar level of seniority) and I would argue that I did this on my own merit, and not because I had a particularly privileged upbringing! Take home message: we're all unique, and putting people in narow boxes only constrains them! Your story really resonates with me. We have a lot of shared experiences. I am from the North East and definitely felt like an outsider when I joined the Fast Stream. I have found the wider civil service to be more diverse but with current external recruitment freezes except the Fast Stream I worry that progress made on diversity will slip backwards. Is there a way to get involved with this? I would be keen to contact you directly about what you are doing? As an outsider, American born and have been in UK 13 years. I have seen very little stratified presents within the civil service. I have worked with my agencies SCS quite a bit and doubt if any of them ever attended the Oxford or Cambridge. I really wonder if there is a problem? Particularly with the hiring processes that are in place. And within my agency there definitely isn't a glass ceiling. The majority of senior level people are women. There is quite a bit of diversity within. Though I am the only token American. I am sad that in the 21 Century, we still even have the statement 4.4% of any particular group come from the working class or any class. I agree with other commentators and feel that the phrase should be abandoned altogether. People from lower incomes have stresses and strains (working class/ lower working class people by your definition perhaps) not felt by many with spare income... these are sometimes mitigated by personality, hardwork, motivated parents, inspiriational teachers but quite often are not. Once employed these things do not go away. I have worked at a low level grade for years and seen many talented, clever people who voluntarily do not try to go further which is a shame for them and the service but understandable. Civil Service as an employer could do more - but I think with Spring Schools, Fast Stream etc it is trying and perhaps the Regional Hubs might encourage more people from the regions to attempt these. But it would be nice if no-one every referred to Class again. Perhaps the Fast Stream criteria could be changed to make it easier for those from the so called "working class" to obtain a place. Plus, why is the Fast Stream aimed at Graduates? I'm a serving Civil Servant, over 50 admittedly, but I could easily do Charlotte's job, or any other Fast Stream job given the training. On that point - I had a bit of a rummage through the Bridge report and it seems to focus exclusively on Graduate (i.e. external) applications to the Fast Stream (it even referrs to it as a 'graduate' rather than the more accurate 'tallent' scheme. As you say, for in-service applications the requirement for a degree has always been waived entirely - which presumably gives people who (perhaps because of their socio-economic background) weren't able to attend university the opportunity to access the benefits of the Fast Stream programme. Given that, mightn't ignoring the in-service intake make the scheme membership look less socially diverse than it really is? Although in-service make up only a small proportion of applications, they have a much higher success rate than general applications (presumably because they are supposed to seek advice from a suitable manager or mentor as to whether they are likely to be suitable, before they make their application in the first place). Hence they may have a significant impact on the overall population of the scheme. Conscious that the plural of anecdote is not data and I can't speak as to whether these people are 'working class' in the definition used here, but the majority of in-service members of the Fast Stream that I know (3 out of 4) came from less affluent areas of the country such as the North of England or the South Wales valleys - I don't know where the 4th is from. Hi Charlotte, I enjoyed your article and the honesty it contains. The subsequent comments suggest we are a much more diverse Civil Service than maybe simple stats suggest. To all of you I'd say use your skills, education and ability to get on and get it done - you are the people who will make a difference! Is there anyone else, I wonder, just a teeny weeny bit fed up of seeing/hearing the words 'diversity/diverse/minority? If writing blogs like this is supposed to 'inspire people' then unfortunately it has the opposite effect on me. I feel very dispirited by it all. I have to say this one of the best pieces I have read in a long time. Having been involved with the Diversity focus group within HMRC last year and coming away with an action plan, its interesting to see how the views are pretty much consistent across many departments and the challenges are indeed very similar around inclusion for all. Diversity is definitely not a one solution to solve all problems - its more around tailoring each improvement with each individual to achieve best possible outcomes. We are on the right track, our road might be bumpy but our destination remains the same. Social mobility is hugely important in the UK, but is decreasing for so many people. Much of this relates to regional discrimination - a discrimination most often overlooked. Opportunity to many jobs (such as the Civil Service with the closure of BIS/HMRC Sheffield) is only for those who live witihn commuter distance in or can afford to move to London. This lack of regional opportunity is a major restriction to the social mobility of millions of people and results in people not achieving their potential and being less productive. On the flip side it also means that the best people for key positions (often in London - Civil Service and priviate sector) are often not recruited as they cannot/do not want to move to London. I agree Joe. Where I live, employers including the Civil Service would rather bring people in from outside the area than recruit local people or even train them. I'm studying for BSL Level 1 because I think it's important to include the deaf community but I got no support for doing so by my employer. Sadly I think being a Northern definitely means you get overlooked on a regular basis especially as there's little access to any government department (HMRC office closures not helping). I think this is a great article and has a lot of interesting points, with a lot that rings similar to my experiences so far on the Fast Track apprenticeship scheme, which is the Fast Stream's younger brother. While at the induction last October I noticed just how many of my peers were from solidly middle class backgrounds with pretty accents and lots of confidence. I don't have the statistics of which percentage are working class, but as the Fast Track is the non-uni route into the Fast Stream, surely it should be an ideal way to attract many working class applicants yet instead it seemed to me that it's not doing this. For myself, I intend to apply for the Fast Stream after I have completed my apprenticeship, however I do worry that my accent (I'm a brummy!) and the way I speak will hinder me in the long term. After all, in my job I am surrounded by well educated civil servants who can speak confidently and with a lot of buzz words, yet I stumble over them when I'm nervous. They're all very nice people but I can't help but feel like an imposter! Perhaps it isn't a problem just with the Fast stream, or with the fast track, or even with some Universities- but with the overall beliefs of working class people. If you think of a civil servant, you don't imagine the local lad down at the pub, you imagine a smartly dressed oxbridge graduate with a perfect accent, a vocabularly full of buzzwords and expensive hobbies! Surely this is what needs to change, that if 16-21 year olds left school/Uni feeling like they could be that person, then they'd apply for the Fast Stream with the confidence in themselves to think they could do it. Because if you don't think that, you're not even going to bother to apply! Interesting article, I wish Catherine every success and hope she finds life in the Fast Stream of the Civil Service more rewarding than it is here at the customer facing end. As someone from a working class background who went from a mediocre comprehensive to a good university in the 1980's , I found myself intimidated and stripped of confidence there. This has sadly continued throughout my working life, where I learned again to keep my head down- being a graduate was rarer in those days and caused me to be regarded as priveleged myself . I am what you would describe as downwardly mobile. I have become this since working in the civil service. My pay, status and lifestyle have been in constant decline for many years working here. I suspect there are many like me. Why does the government care about about social mobility? I would guess they do care about being seen to be doing the right thing. And they do care that an illusion of a fair society is projected. If a handful of 'working class' people (who knows what that means) get a hand up that does not mean the system is working and it changes nothing. I'm the same. Middle class background, excellent education, but unable to progress due to severe lack of career development options in the remote rural region I live in, unable to afford to move elsewhere and also stuck due to family circumstances, and pay stagnation meaning I'm scraping pennies together at the end of the month. I have fallen way behind my school peers and career ambitions, and disappointingly been stuck at EO grade for a very long time (apart from a couple of spells of temporary promotion). One particular protected characteristic is noticeable by its absence from the discussion in both the article and the report- age. I find this disappointing but not surprising, given that we are now expected to work until our late 60's. The debate is excluding a large cohort of experienced people who may wish to reinvigorate their career (not necessarily via the fast stream) after raising a family but are not as prepared as younger colleagues to indulge in the long-hours culture. I agree with those who say the debate should be nuanced. I went to an average comp in the Midlands and was the first person in my family to go to a university (currently 11th in the Complete University Guide league table) at a time when 2% of school leavers went on to higher education. So I do well in terms of social mobility when education and income are taken into account. My husband left school with a single GCSE and became a company director. Our son is going to a university (54th in table) at a time when 50% of school leavers go on to higher education. He attended a state school in Greater London. What was the starting point for measuring his social mobility? Very interesting article Charlotte, thank you. "The third of the population in employment who are working class" is an interesting statistic; I wonder what measures have been used. The term "working class" is increasingly problematic. We are usually told that we are all middle class these days. Certainly what used to be known as the "aspirational working class" became middle class some decades ago, and wanting to apply for the Fast Stream is surely aspirational. I take issue with the emphasis always being on universities, and in this case, the Civil Service, to improve "access". While these institutions have a part to play, surely the main focus should at the education stage: on improving our patchy state education system to ensure it can compete with the private sector in every part of the country. In senior roles, what accent you have (assuming you are clear and articulate) should not matter one bit. Having a good vocabulary, on the other hand, should. The bit I find interesting is that only one third of the working population are working class. Does this mean two thirds are middle/upper class? That doesn't sound quite right to me. I agree with S about being downwardly mobile. Until about 8 years ago (before the pay freeze in DWP) I bought clothes in ordinary shops liken Next and Wallis but now I shop in charity shops - my hours/personal situation/responsibilities etc are unchanged, it is only my income which has reduced markedly in real terms. I joined the Civil Service nearly 30 years ago, having been a secondary school teacher, and at that time I took only a small pay cut when I moved from teaching to the EO grade but now the gap between teacher pay and EO pay is much much larger. 30 years ago the CS was still considered a "good" and eve fairly prestigious job for a graduate but not now. Regrettably I agree with S.
The current emphasis is on an “illusion of a fair society.” Although it is interesting the small number of respondents who actually recognise that class is still an issue. I joined the civil service in the East Midlands in the 80s and worked for Jobcentre Plus for many years. Then I might perhaps have made similar comments. But then (mostly in the spirit of wanting to get on) I moved to Whitehall and suddenly found I needed to work with senior people who went skiing, to the opera and employed nannies. This was an educational experience but I too learned to keep my head down. I quickly learned none of them recognised the stresses of a difficult family background or indeed of long-distance commuting. Ultimately the truism that people tend to promote those who are like themselves seems to hold good and I wish Catherine the very best of luck. She may need it! An interesting report. I dont necessarily feel anything will be done as a result of it though. Re: London-centric; this has always been an issue and the Civil Service has had multiple chances to move to regional based centres to facilitate a better geographical spread, but has always resisted doing this. Why? I would be really interested to hear the rationale behind this, or better still confirmation that Northern hubs will be utilised for Fast Stream entrants in the future. As for confidence and speaking abilities-i'm not sure about this. Some of the most gobby people I know come from lower SEB's! the confidence to speak can come from any background but perhaps it is the context that is more important-do those from higher SEB's actually know what they are talking about, as opposed to the lower? or are they simply better at preteding they do? A lot of effort is made to assist visible minorities but other severely disadvantaged minority groups, such as people from the Welsh Valleys, where some of Europe's poorest boroughs are situated, get no special assistance and have no advocates in government. This seems unfair and can cause resentment. "A lot of effort is made to assist visible minorities but other severely disadvantaged minority groups, such as people from the Welsh Valleys, where some of Europe's poorest boroughs are situated, get no special assistance and have no advocates in government. This seems unfair and can cause resentment.. "
To be fair Wales , Scotland and NI do have their own advocates, their elected Parliaments. Those living in England lack such advocacy with the exception of London and other areas that have limited local powers. This is an issue I have with Civil Service communications. There is a lot of discussion around diversity and fair outcomes but I have seen no firm action on the one thing which the employer's power to act upon or remedy, the persistent discrepancies in performance markings and pay meted out to some groups compared with others. The answer always seem to be that they are concerned and will analyse results, but after so many years that excuse wears thin. I've personally found Class to be akin to Ghosts- they only exist because people talk about them. Thanks for this interesting article.The civil service influences decisions that impact on the whole country, and provides services for everyone. Therefore the extent to which the civil service is representative of the public really matters. There is a risk that policy options are formulated and analysed with an unconscious middle class, academic, London bias that is unaware of the effect on millions of people. For example, does the civil service give the correct level of concern to manufacturing industry, or hill farmers? Or vocational qualifications? Even though concepts like "working class" and "social mobility" are hard to define, I think the issues are important. Perhaps a few more civil service jobs outside of London would help. Just to play Devil's Advocate for a moment, from an employer's perspective, why should Social Mobility be so important? I can see that if you are recruiting police officers, those officers should be able to engage with the local community, and it is therefore necessary that the intake of new police officers properly reflects that community. But Senior Civil Servants rarely have to engage with the community in the same way - their job is to consider complex policy problems which require in-depth analysis and other highly developed skills like critical thinking. If it so happens that the people who have those skills and abilities - the best people for jobs in the Senior Civil Service - happen to come from our top universities, then so what? I have no vested interest here - I am not a fast streamer, I am a "plodder" who has worked in the Civil Service for nearly three decades. I am just wondering out loud, whether it matters a jot what your background is, if the primary purpose of the Senior Civil Service is to deliver good and effective Government, rather than reflect some arbitrary notion of what a "fully diverse" society should look like? If so, do we give a hoot whether the Permanent Secretary went to Oxbridge or a private school or whatever? Perhaps the best way to tackle an issue like Social Mobility would be through the education system, which should be properly catering for pupils of all backgrounds, and giving them the confidence to work in any workplace for which they are suitable, rather than leaving it to employers to pick up the pieces. Finally, I would question whether Social Mobility is a matter of pressing public concern anyway. Surely the public are more interested in government working to raise living standards across the board, rather than tinkering with who is able to get into the relatively small number of "top jobs"? The point is surely that these critical thinking senior civil servants lack the perspective of the majority of the population their decisions effect because of the narrow socio economic strata they currently come from. My dear old mum worked in a munitions factory in WW2 then did night classes and got herself to Oxford, to study medicine, in a very much male dominated world. She was very sanguine about it all, though I always felt she had to prove her worth to her peer group more than her male counterparts would have had to. She disliked the term ‘working class’, pointing out that she was still working class even though by now she was a consultant, because she had to work to live. I’m one of four boys, and none of us went to university, despite (in my case) spending a few years at a public school. I suspect my IQ is average, but my education was pretty good, and I had every advantage. But I wanted to go walkabout, get out in the real world, have a varied career etc. So now, aged 63, I’ve had an interesting but not especially eminent life, working in both private and public sector, doing manual, clerical, technical and managerial work at various times. And c1984 and again c1998 I moved from London, where I grew up and had worked some years, to work in the North, attracted by a region that had once made that which mattered for Britain’s economic prosperity and that might yet do so again. My wide ranging experiences and accumulated insights ought to make me very useful to a wide range of organisations, but in reality I have come to feel (and to see myself as) an ‘outsider’. I have come to believe also that we too often overlook the value of having a diversity of experience (which in a sense is at the heart of all diversity) inside an organisation. Focusing on how to get more ‘working class’ people into the CS Fast Stream is OK (though as others have observed, and my background shows, the offspring of last generations successful working class parents may end up as this generations pilloried posh, should they aspire to the CS fast stream). But what is being done to incorporate/include into the core of the CS people with a strong emotional intelligence and empathy born of diverse experience. Not enough, I’d suggest, from my observations since arriving here at 50+. Instead, everybody wants to be ‘where its at’ instead of where we need more people to be, and class division is just one of complaints of those clamouring to get in. Personally, I’m over the moon to learn today that Aston Martin is to build its new factory in South Wales (Allelujah! Allelujah!). What a stunningly cheering piece of news, albeit that the growing social divide is underlined by its being a factory where they will make cars for the world’s super rich (but hopefully not the next generation of CS fast trackers – that’d be very not Sir Humphrey). So, getting people out of those ivory towers and interested in the rest, is what I would advocate. Congratulations, Charlotte on everything you have achieved in your career so far. However, reading your article and the comments made I am drawing the conclusion that I and my colleagues are no longer (have we ever been?) civil servants. I have spent my career in DWP (Family Credit - now Benefits and Credits) and HMRC as a VAT Assurance officer in Preston and Manchester. I am hard pressed to think of any of my colleagues who attended Oxbridge or any university for that matter (I myself did attend Manchester Polytechnic and got an ordinary degree). As far as I am aware, we all (when asked) described ourselves as civil servants. Most of us describe ourselves as working class. Many of us have done very well in our careers and are proud to have served in the civil service. The impression from the article is close to that portrayed in the media generally - Civil Service means Whitehall. It shouldn't. I can see quite clearly that there is a socio economic bias in the higher echelons of the service, evidenced by all that you say about the fast stream etc. However, the vast majority of us working hard to bring that service to the public are from the same back ground as those we serve. However, moving to regional centres as HMRC are about to do can only lead to a loss of that link. As a Civil Servant, resarch companies class you as in the ABC social groups, so for the last 24 years I now appear to be 'Middle Class' whatever that is? My son has been to Uni - am I now Middle Class? I know Doctors work exceptionally hard - but definitely are not 'Working Class', Those working in factories five and half days a week, toiling in heavy industry were working class? But, how many of those jobs exist now? We are a Service Industry economy. Don't we now have Those claiming 'allowances/credits, and everyone else is middle class and above. Those going to Oxbridge / Etan are Upper Middle class or just Upper class Isn't it 'Hard Working People' now, anyway? I have lost count of the number of times I've been described by colleagues as "the poshest person I've met". What they don't know is that I support two adult dependants living on benefits, my accent was honed an assisted place at school, and I am bored of being judged at face (/voice) value. I can quite see it might be intimidating to be surrounded by RP if it's not what you're used to. But colleagues' shouldn't leap to assumptions about the person behind the voice. As many people commenting on this thread have said, 'class' is a pretty mutable phenomenon. Its far worst for colleagues outside the Fast Stream. The most important factor for success is the ability to network and becoming part of 'in-groups' with power and influence. With that, you gain the 'Halo' effect and heightened visibility. Getting to know through informal contacts, decision makers on Promotion Boards, secondments and such like. As an outsider, social exclusion and lack of recognition for your achievements continue to be huge problems. With these factors in mind, 'fair and open competition' may often not exist. It's good to know that some people are privileged enough to consider themselves working class. We also have the precariat class so if the working class are considered to have low representation in seniority then those born into social deprivation and essentially a childhood living by the fortnightly Income Support giro and gas and electric meters running out have next to no chance of representing society in the Senior Civil Service. It's great that the surface is starting to be scratched here and initially focusing on the supply side of talent is the right thing to do and encouraging. We are though a very long way off actually having a government/civil service that truly represents the society it serves. However speaking from personal experience, you can escape the deprivation and enter into the corridors of power. Usually you bring your education with you, for me it's reverse. The CS has given me the education and refinement I never had or could hope to. But there is no helping hand, you're either made of the right stuff or not. I keep reading about the need for widening the diversity of those entering on the Fast Stream. There are four things I'd like to see changed to help this happen. I'm in my 50's, my parents left school at 15, I grew up on a very large northern council estate and went to a very large, tough comprehensive school that sometimes sent 4 a year to university. I guess that makes me working class. I became the first person from my school to go to Cambridge - I am now one of a privileged elite? I think it all helps to when engaging with people from all social backgrounds. I match your profile all the way until Cambridge (I went to Leeds), and managed to graduate without the civil service even entering my radar. I'm only in the civil service now because when I hit fifty I was looking for a change in career and the civil service was mentioned in an article about defined benefit pensions. Charlotte, I think this is a well written article that foregrounds feelings that many can relate to. Well done on getting through. Many posters on this thread are saying that the civil service is too London-centric. That certainly does not apply to my own department (MOD), whose largest site is Abbey Wood, Bristol. Coincidentally it has had, since its opening in 1995, the biggest recruitment problem of any management area in MOD, if not in the entire civil service ; currently there are in the region of 1,000 vacancies, in a variety of specialisms (finance, commercial, logistics management, engineering) and certainly the opportunity for career advancement. Clearly you won’t get Londoners wanting to work in Bristol (I had to fight tooth-and-nail to avoid a forced move down there in the early 90s) but surely there are local born and bred Bristolians who would relish the chance to get a job at one of the least insecure government sites in the country. By contrast, the tiny handful of MOD sites that are left within the M25 have no recruitment problems at all, and in fact are likely to be inundated with applications from staff from HMRC which is about to reduce to two sites (Croydon and Stratford) within the M25. A very interesting post LITTLE LONDONER. I’d love to get your take on why things might be as they are. When I was asked years back as a manager (in the private sector) to move from London and live in the region I was responsible for, I didn’t fight tooth and nail to avoid it. A few years, later when cutback and redundancy came along, my obvious interest in our organisation and the thoughts and ideas I’d passed back meant that I was not selected for redundancy but instead got asked to help set up a new team with a challenging new brief (something many said we’d never pull off, but we did, and very successfully). Loyalty to one organisation arguably lined my pockets less well than sticking in London and career hopping (with nice redundancy handouts) might have done. On the other hand I’m still working, and by now with a very varied and interesting working life behind me, at almost age 64. I was always vocationally driven in any case (as you might hope public servants would be), and I hope I was able to make a difference in areas of work that meant something to me. I can understand why Londoners might not want to leave the bright lights. But until enough of them do, things can’t change. Fear and lack of opportunity elsewhere drives people to head for and cling to London, perpetuating an unvirtuous cycle. But I’ve always been struck by Roosevelt’s saying that we have nothing to fear but fear itself. Likewise John F Kennedy when he suggested we ask not what our country can do for us but ask ourselves instead what we can do for our country. But I’m not naive. When I left London, my tooth-and-nail contemporaries certainly looked at my willingness as that of a fool. And very often such a move can be viewed in hindsight as foolish. But where that happens, it should be seen more as a (poor) reflection on an employer than on the willing employee. It wouldn't do for us all to be the same, look the same or think the same was one of my late 'working class' Dad's favourite sayings - be authentic, be true to yourself and remember the life experiences that helped to shape the person you are. Charlotte, thanks for the article and congratulations on your advance within the Civil Service. I just wanted to comment on the many posts complaining about use of the phrases " working class " , " middle class " etc. It is impossible to talk about social mobility without giving a name of some sort to groups of people from different socio-economic backgrounds and whatever names we use someone is going to be offended - impoverished & privileged ? deprived & posh ? Getting hung up on semantics doesn't advance the debate. Also I was disturbed at hints of inverse snobbery which is every bit as insidious as regular snobbery. It is unfair to be dismissive of someone for having a " pretty accent " and while it is undeniable that some people from privileged backgrounds may have benefited from undeserved advantages in the workplace the majority are decent people doing a decent job. Sue mentioned that she had to work with people that go skiing and to the opera as if they are a different species that might be dangerous. I can't afford skiing holidays but culture is readily available for everyone, our national galleries are free and the ENO, RSC and National theatre all regularly screen live performances in cinemas. Why not give opera a go ? It's not just for "posh" people, you might like it and if you don't at least you've tried something new. I wholeheartedly agree that social mobility is vital if we are to have a Civil Service and Government that properly represents the interests of all members of society . I also think class war is unhelpful and demonising any area of society is counterproductive. What would also be helpful is finding some way to ensure everyone properly understands the problems that face the poorest members of society. At the risk of opening another can of worms , maybe we could bring back national service, strictly non-military, and ensure everyone has to spend time working in care homes, hospitals, drug rehabilitation centres, homeless shelters in the most socially deprived areas, just a thought, it could make for a more compassionate and caring society. The Office for National Statistics moved from London to Newport in the late 2000s, against the advice of the Bank of England, which was rightly concerned about the ability to recruit economic analysts in Newport and retain the ones that they had in London. So all this talk about the civil service being London-centric fails to gel with the hard evidence. Has anyone here in South Wales tried to get a job with the ONS at Newport? By the way, compared to the Italian and Spanish civil services (very Rome-centric and Madrid-centric respectively), the UK civil service ius very spread across the nation. Spanish single-service military commands are all in central Madrid, UK's are in Andover (Army), Portsmouth (Navy) and High Wycome (RAF). Italian national statistics office is 5 minutes' walk from Rome central station. Coming to this late - really interesting issues raised by the comments on this article. I wanted to challenge the notion of drawing a crude line between fast streamers' social classes. I am a current fast streamer. I understand that the fast stream measures my social background based on parental occupation/education, whether I went to private school or not, and whether I received free school meals. My dad is a blue collar worker and didn't go to university, my mum a white collar worker but gained her degree in her late 20s while starting a family, I went to a good but non-selective state school in rural Wales, then to a Russell Group university, I didn't get free school meals, but I've not had parental hand outs and have a large student debt after I studied for 5 years maxing out maintenance and fee loans. I didn't know any one who had worked for the Civil Service when I applied. I suspect the fast stream has classed me as middle class on the basis of my mum's degree and my non-receipt of free school meals. But I do question whether the stats on social mobility might overstate the notion of "privilege" amongst fast streamers as surely few people are going to fit neatly in one extreme or the other. I recognise that having a parent in a professional job with a degree did make much more likely that I would go to university - but not necessarily apply for the fast stream.